Trampolines are considered one of the best ways to entertain your kids. There are lots of types of trampolines available on the market nowadays. They were invented somewhere around the 1930s’ by a young gymnast George Nissan and his coach. The first trampoline was used as a piece of equipment and was made of tire inner tubes and scrap steel. Before becoming a fun toy for children, trampolines were used for training astronauts and athletes. Modern versions come in all shapes and sizes, with safety handles and nets for small kids. Trampolines can be used indoors and outdoors, depending on the type of the house the family lives in. Indoor trampolines are usually of a small size, they can be foldable and have support handles. Those which are meant to be used outdoors are much larger and have a safety net. Today, it is impossible to imagine a typical backyard without this enjoyable toy for children. Any family can afford this item, as they are represented in various price categories. An enormous number of models is represented in the stores, and it is easy to choose the one which fits your taste, size of the yard and wallet. Of course, it is better to invest once into a good thing which will be used for many years, than to go for a cheaper variant of doubtful quality and made of unsafe materials. For many parents, an important thing is a shape of the trampoline. Rectangular and circular trampolines have their own pros and cons. The choice depends on your personal preferences and living conditions. The rectangular trampoline is mostly used by professional athletes during competitions. This shape allows the sportsmen to perform various tricks and twists and gives them more space during the contest. Because of their professional purposes, they are made of high-quality materials and are much stronger than round trampolines. That is why this kind of equipment is normally more expensive. The downside of being made of strong materials is the fact that rectangular trampolines are heavy and, as a result, hard to move around. So, many families might see it as a trouble in case they want to replace it or put it into the storage for winter, for example. One of the good things is that this shape fits perfectly into the corner of the backyard and thus allows you to use space more rationally. Round trampolines are meant to be used as a mass product by most of the families with kids. Much less steel is used to make a lighter frame for this type of equipment. For this reason, they are usually much cheaper than square or rectangular ones. It is possible to assemble and disassemble them without professional help. They are often equipped with safety details such as handles, nets or other accessories. Another thing is that due to the shape, the person using a circular trampoline tends to stay in the middle of it, which is an obvious advantage for those who have small kids. While using this shape, weight is evenly distributed between all the springs, so they are stretched evenly. This means that they are not worn out very quickly. Do not forget that no matter how expensive and safe your trampoline is, it is always important to follow certain rules in order to avoid injuries. Read the instructions carefully before installing the trampoline. Use the net to put around the trampoline for more safety. Make sure there is an adult watching the children while they are playing. Put soft mats or sand under the trampoline and remove hard or sharp objects from below it. Use comfortable clothes and don’t wear jewelry. Do not forget to have fun and enjoy precious moments with your family! If you are still looking for the perfect trampoline, but not sure which one to choose, contact Douglas Forest & Garden. Our team will be happy to help you. There is nothing quite like jumping around on a trampoline in your garden. Trampolines are the ultimate toy which encourages and challenges kids to exercise outdoors. With our range of trampolines, the options are endless. Choosing the right trampoline can be difficult, a number of factors need to be considered, like the size, the price, the colour, the bouncing comfort and the overall quality. All our trampolines are attractive due to their modern and cool design as well as great quality. They guarantee safety and last a long time meaning great value for money. Here are 3 fantastic EXIT trampolines for kids. An EXIT Supreme ground trampoline is a round shaped, top quality trampoline. This trampoline lies lovely and safely at ground level. You never have to worry about a child falling off with this outdoor toy. It has double-conical springs which ensure a high bounce and a soft landing. The de-aeration system of the padding and jump mat ensures that air can easily escape while jumping. Included also is a feet safety system which prevents feet from getting caught in the springs. This trampoline is long-lasting due to its extra strong padding being UV-resistant and its frame is galvanised. Due to being powder coated, there is no chance of rusting. The EXIT Supreme comes in 10, 12 or 14 ft sizes along with a choice of two colours green or grey. Manual is included for easy assembly. 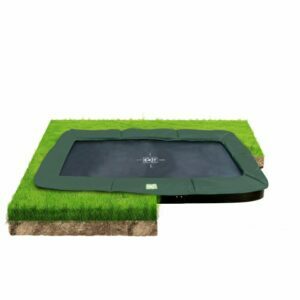 The EXIT Silhouette Ground Level Trampoline is a modern and beautiful inground trampoline. It has lovely black padding with a refreshing green colour featuring throughout. Children can easily go in and out of this trampoline because they don’t have to climb. Its protective edge is thick and covers the springs effectively. A safety net securely covers the space between the protective edge to ensure safe jumping for kids. The protective edge has wide deaeration strips which provide optimal comfort during bouncing. The trampoline has long springs which guarantee solid jumping and comfort. The frame is powder coated and galvanised to prevent it from rusting. The separate parts of the frame are mutually locked using spring clips so that they cannot come apart while in use. This trampoline can be assembled very easily due to its construction. The EXIT Silhouette Ground Level Trampoline + Safetynet comes in 8, 10, 12 or 14 ft sizes but only in the one colour. The EXIT JumpArenA All-in 1 trampoline is a top quality trampoline that will look beautiful in your garden. Thanks to its beautiful green greeting and black powder-coated and galvanised frame, this trampoline looks luxurious and doesn’t rust. The cover edge has reversible sides which are both a different colour so you can choose between a lovely green padding or grey padding. The screw connections in the frame keep it fastened securely while jumping. The springs of the trampoline are protected by the net which prevents dangerous situations. The jumping mat is made of high-quality Ten Cate material, especially from the United States. The trampoline comes with a ladder containing a set of steps for easy access to the trampoline. A frame-suspended bag allows children to store their shoes and other items before entering. The padding contains drainage holes to drain away any rainwater. 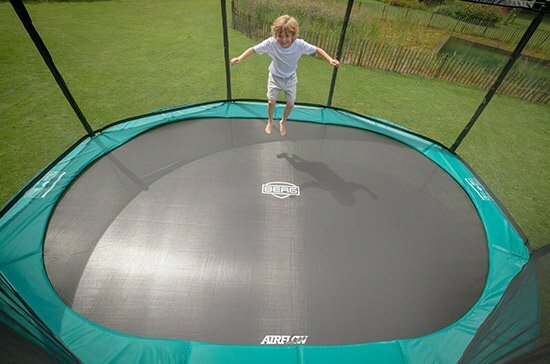 The EXIT JumpArenA All-in 1 Trampoline comes in 8, 10, 12, 14 or 15 ft sizes and in the one colour. If you’re still not sure which is the perfect trampoline for you, then contact Douglas Forest & Garden, we will help you find the perfect trampoline for you and your needs. Visit us online today or call us on 021-496-5132. Christmas is fast approaching and as parents, we all want to make it a time to remember for our children. A huge part of the occasion is giving and receiving presents. A question lots of parents ask themselves is ‘what presents should I get for my child?’. If you are one of those parents, don’t worry we’re here to help. It’s never too early to get a start on finding the coolest gifts you can buy for your child. If you want to make sure your little one has presents they will enjoy getting on Christmas morning, then look no further. Here are 3 toys that would be perfect gifts for kids on Christmas. 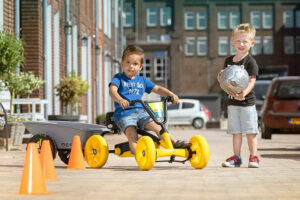 The Berg Buzzy BSX go-kart is a sturdy and sensational go-kart, It is suitable for kids between the ages of 2-5 years. The four wheels and swing axle make this go-kart super stable even going around the tightest corners. Within seconds you can easily go forwards, backwards and come to a standstill. The pedals remain within reach at all times. The BSX has a stunning colour combination of yellow, black and blue. The seat and steering wheel are adjustable so that children can enjoy this go-kart for years to come. The dimensions (lxwxh) of the Buzzy BSX go-kart are 83x49x50 cm, it weighs 7kg and the maximum weight it can withstand is 30kg. Note with this go-kart it is important to keep an eye on children when playing with this toy as its small parts can be a choking hazard and also there is no brake feature. The Berg Rally Pearl go-kart is a real eye-catching toy. 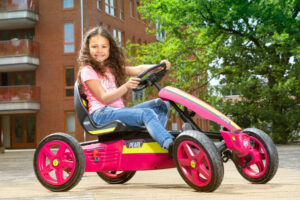 With this fantastic go-kart, your child will be driving in style in the neighbourhood or at home. The Rally Pearl has exciting colour combinations, it is a mixture of yellow, black and dazzling purple/pink colour. This compact go-kart has a small turning circle which makes it very agile and manoeuvrable while driving. The BFR system in this machine lets you drive forward, backwards and brake by using the pedals. There are 4 pneumatic tires and a swing axle which adds extra comfort, reduces noise and adds stability while driving. The Berg Rally Pearl is perfect for kids aged between 4-12. The dimensions (lxwxh) of the go-kart are 124x70x64cm, it weighs 25kg and the maximum weight the go-kart can withstand is 60kg. The EXIT InTerra ground-level trampoline is completely integrated into the garden. This high performance jumping mat comes with green padding and a unique ventilation system so air can escape easily while jumping. It lies completely within the garden which means the utmost safety as it cannot fall. The InTerra ground-level trampoline gives your garden a beautiful look with its rectangular shape. There are 17.7cm long double-conical springs in this trampoline which ensure high bounces and soft landings. It has a strong padding and a foot protection system which prevents users feet from getting tangled while jumping. The metal frame of this trampoline is galvanised and powder coated making it weather resistant and incapable of rusting. It is 244 x 427×3 cm in size (length, width, height). Assembly is required however don’t worry as the manual is included making it easy to put together. Any of these three toys would be perfect presents for your child this Christmas. To see our full range of kids toys or learn more about these three products, visit us online today.